I’ve noticed that despite the many differences between practicing law and writing about football, some of the complaints are the same among those both arenas. When I was a lawyer, fatigue and “hurrying up to wait” were two of the most common gripes among my fellow barristers. Imagine rushing around all morning to get the kids to school, get yourself to a courthouse, get through security, and rush in for a trial only to find the morning docket is so crowded that your 9:00 AM trial doesn’t start until after lunch. Frustrating, but that much more frustrating when you’ve been up all night, tossing and turning because trials are always nerve-wracking and maybe you’d be better off doing something else with your life… like sportstriting, but I digress. Anyway, the same feelings can be shared among the crowds at an event like Big Ten Media Days. You’re waiting for the next speaker, you’re a bit tired, maybe you were up late writing or doing other work, and you weren’t able to sleep that well. Look, it’s not the toughest job in the world, I get that. I’ve worked summers as an exterminator. Now, crawling on your stomach in a crawl space to dig a trench to pour in some insecticide? That’s hard work. Waiting at 8 AM for the first speaker for a football conference and trying to wake up? It’s not exactly trench-digging. But you’re still sleepy. It was no surprise that Fleck was a hot commodity this past offseason. Under his tutelage, the football program at Western Michigan went from a team on the lower rung of the MAC to playing in a “New Year’s Six” bowl. 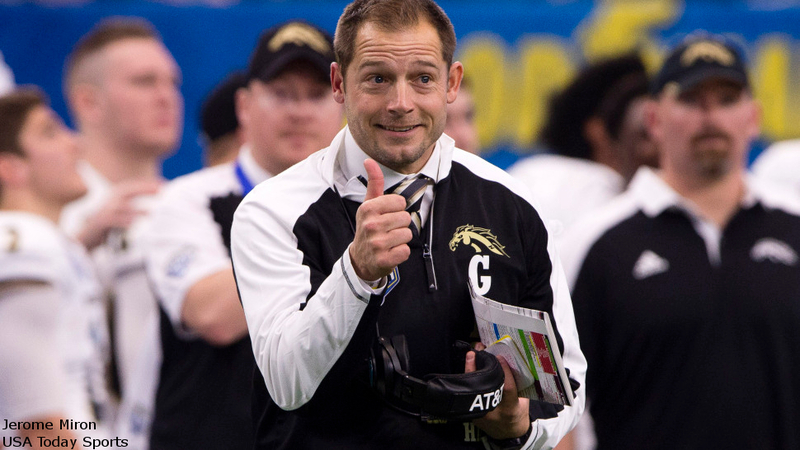 In his first season in Kalamazoo, the Broncos went 1-11, with their only win coming against Massachusetts when the Minutemen botched a two-point conversion late in the game and Western Michigan held on for a one-point victory. But the following season, the Broncos finished 8-5, ending the year with a loss in the Famous Idaho Potato Bowl. In 2015, Western Michigan tackled a brutal non-conference schedule, taking on Michigan State and Ohio State, but they again finished 8-5, ending the season with the school’s first-ever bowl win, a victory over Middle Tennessee in the Bahamas bowl. “Why Minnesota?” Fleck said at his introductory news conference in Minneapolis. “Why not? “As you hold your son as he passes away, your whole life changes. What you believe in, how you’ve believed in it, what you’ve done to that point, where you’re going to go and how you’re going to live your life all changes. But Row the Boat is really my second son’s life as I continue to live his life for him. It’s his life. And I just want everybody in here to understand how honored I am to be the head football coach at the University of Minnesota. I think I speak for our entire coaching staff, the ability and the honor it is to coach in the Big Ten, one of the most prestigious conferences academically, athletically, socially and spiritually in the country is really a dream come true for a lot of our guys. One of the main reasons we ended up leaving Western Michigan was to be able to have our assistant coaches have a lot of their dreams come true as well to be able to coach at I think the most prestigious league in all of college football. It’s a wonderful challenge here at the University of Minnesota, one we look forward to attacking as we go forward. We’re not shying away from what we haven’t necessarily accomplished in terms of championship feel of 50 years without a championship, but we want to be that bridge. We want to be that bridge that connects the past with the present and also the future moving forward. Fleck inherits a team that won nine games last year, but that came with one of the easier schedules in college football. This year the Golden Gophers get trips to Michigan and Northwestern at the end of their season. And while they could start fast with five winnable games, a mid-season stretch with Michigan State, Illinois, and a trip to Iowa sets them for a tough stretch run. They close out the season with a trip to Ann Arbor, home against Nebraska, a trip to play the Wildcats, and then close out the season against Wisconsin in Minnesota. That final stretch will go a long way toward determining just what kind of impact this young coach can make in his first year. But if Fleck can wake up a room of tired sportswriters and motivate them on a Tuesday morning in July, then maybe that late-season stretch won’t be as tough a task. Follow @MarkSchofield on Twitter. Buy his book, 17 Drives. Check out his other work here, such as a self evaluation on scouting, a look back at the 2015 wide receiver class, or his collection of work on the 2017 Senior Bowl Quarterbacks.